Advisor: Kathleen A. DuVal, Associate Professor of History and Director of Undergraduate Studies, University of North Carolina at Chapel Hill, National Humanities Center Fellow. Some European attempts to colonize the New World failed not only because of physical hardships and deprivation but also because of cultural misunderstandings on the part of both the colonizers and the native inhabitants. A letter from Jesuit Priests Luis de Quirós and Juan Baptista de Segura to Governor of Cuba Juan de Hinistrosa, Sept. 12, 1570. Scroll down for the English translation. Pay attention to the footnotes; not only do they help explain what is going on in Ajacán but also provide insight into the difficulty of interpreting the text. Find additional primary sources on failed colonies and almost failed colonies in American Beginnings: The European Presence in North America, 1492-1690. Grade 11-CCR text complexity band. Prior to British attempts to colonize the eastern coast of North America the Spanish worked to expand their presence up from Central America. 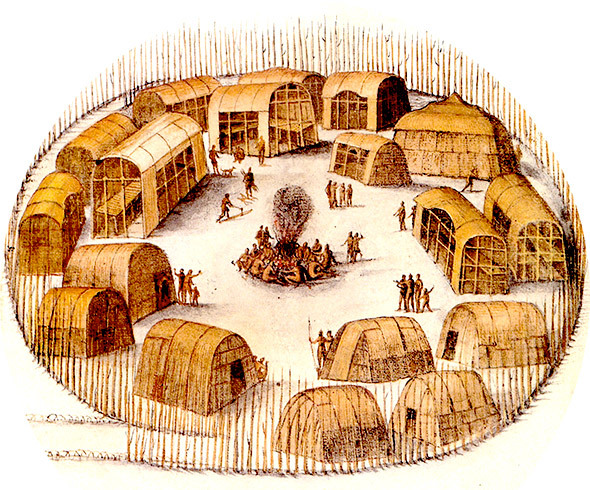 In 1570 they founded the small colony of Ajacan on Chesapeake Bay in order to Christianize the local Indians. It is important to note that Ajacán was not intended to be a substantial settlement like the failed British colony of Roanoke or the successful colony of Jamestown (for a companion lesson, see Successful European Colonies in the New World). Once established on shore, Father de Segura dispatched his ship and crew to Cuba with the letter we are considering here. He felt that this small band of nine newcomers plus a tribal member, all unarmed, would hardly have threatened the Powhatan. Why, then, did the Indians, apparently friendly at first, kill the Spanish just a few months after they arrived? When we attempt to answer that question through this text, we immediately confront an interpretative thicket. First, we have no direct account of how the Powhatan responded to the Spanish because the Indians left no written records. Second, what we do know has been shaped by two reporters: first by de Velasco, who presumably translated for the priests and who may have shaded the Indians’ words one way or another for his own reasons, and second by the Jesuits, who were trying to persuade the governor of Cuba to supply their mission. What might de Velasco have been trying achieve upon being among his people again, and how might his goals have shaped the way he presented the Powhatan’s words to the missionaries? What were the Jesuits trying to achieve, and how might their goals have shaped the way they described their experience to Governor de Hinistrosa? We offer three passages for discussion. The first passage is a series of three short excerpts in which the priests describe how the Powhatan reacted to their arrival and to the return of de Velasco, whom they had not seen in nine years. 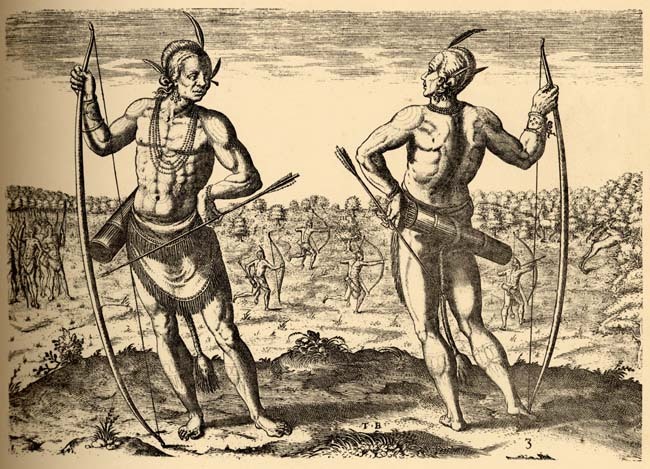 It seems that at first the Powhatan welcomed both their brother and the Jesuits. The second passage includes two excerpts that introduce questions of food, the Indians’ expectations of the visitors, and the potential for conflict. The Jesuits hoped that they could convert the Powhatan and establish a foothold in the region that might eventually lead to the conversion of what they thought was China. These excerpts reveal the importance of food in drawing Indians to visit the mission. The third passage foreshadows the trouble that may be brewing and can be used to raise directly the question of what happened between the Jesuits and their Powhatan hosts. Someone on the Spanish ship gave some Powhatan “trinkets” in exchange for corn, so then, according to the priests, the Indians began to think they should always get paid for their corn. What conflicts could such trade cause? Maybe the Powhatan were teaching the Spanish their reciprocal rules of trading. The Powhatan gave the Spanish corn and expected in return seeds that the next Spanish ship was bringing (perhaps the priests had described seeds for other kinds of plants in which the Powhatan were interested). The Spanish seemed to be operating under the kind of reciprocity the Indians expected, but then, through a “bit of blundering” by a Spanish crewman, the Indians found out that the Spanish had “trinkets,” probably glass and other interesting items that were not mere trinkets at all to the Powhatan. So the Powhatan began expecting, by the rules of reciprocity, to get those things rather than to wait for the promised new ships. Perhaps the Powhatan felt insulted over what they took to be deception, which was completely against their rules of reciprocity. Maybe the Powhatan killed the missionaries to lessen the number of mouths they had to feed in a time of severe scarcity. Maybe Father de Quiros had it all wrong, and the conflict was not about food but about something else. Maybe de Velasco told his fellow Powhatan that the Jesuits were the advance troops of a militaristic society, which is precisely what Spain was. Maybe the Powhatan intended to kill the missionaries right from the start and simply waited for an opportune moment. Maybe the priests are covering up something they did that sparked violence, such as stealing corn. If students are frustrated with the lack of information, let them know that it is acceptable to make educated guesses based on the little evidence we have. If we want to know anything about Indians before the nineteenth century (and we do! ), we have to deal with scanty sources as best we can. One of the points of this lesson is to teach students to be ethno-historians, to try to discern the motives and actions of people who did not leave written records. In addition, with this text you can help students see that mutual misperceptions and misunderstandings of things like language, expectations, and cultural practices could doom a colony just as effectively as famine could. 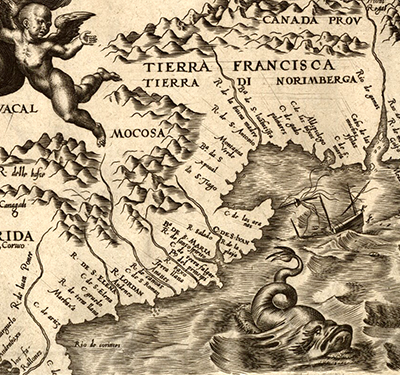 In 1570 Spanish Jesuits Juan Baptista de Segura and Luis de Quirós along with seven other missionaries, both clerical and lay, founded Ajacán on the shores of the Chesapeake Bay, intending to convert the local Indians to Catholicism. Because Father de Sugura had seen how soldiers undermined the work of missionaries in Florida, he forbade them to accompany his small band. The Indians spoke an Algonquian language and were ancestors of the Powhatan, whom the English founders of Jamestown met in 1607. We do not know what they called themselves in 1570, and their seventeenth-century name may have come from the name of their leader at that time. For clarity in this lesson we will call them Powhatan. As you analyze the text, keep in mind that these Indians existed in a culture all their own. A Spanish slaving ship had captured a young man from this tribe in 1561. In his nine years away from home, he was baptized into the Catholic faith, christened with the new name Luis de Velasco (we do not know what he called himself), and traveled to Spain, where he met the king. While in Spain, de Velasco said that he wanted to go home and convert his people to Christianity. He led the Jesuits to the Chesapeake, where they founded Ajacán. About five months later de Velasco and the Powhatan slaughtered eight of the missionaries. To help sort out the voices in the letter, note that the first five paragraphs were written by Father de Quiros. Paragraphs six and seven were written by Father de Segura, and the final three paragraphs are again the work of Father de Quiros. 1. In what condition were the Powhatan when the Spanish arrived? They are “famished.” They believe they may not survive the winter. 2. The Powhatan seem to take de Velasco’s return as a good omen. Why? What might they have thought he and the Spanish could do for them? The fact that he has returned is a good sign. Kidnapped years earlier, he was probably given up for dead, and this is a return from the dead. They hope he and the Spanish can relieve their famine. 3. How would the translation of Indian religious concepts into terms like “Heaven” and “God” have affected the priests? How might they affect Governor de Hinistrosa? They would have encouraged the priests in their efforts to Christianize the natives. The translation would have encouraged the Governor to send supplies to the colony in order to aid the efforts of the priests to Christianize the natives. 4. How might the priests have understood de Velasco’s claim that the Powhatan wanted to be like him? What might the Powhatan have meant? The priests might have understood it to mean that the Powhatan wanted to become Catholic like de Valasco. The Powhatan may have believed that de Velasco was dead, as he had been gone so long. They may have meant that they wanted to be strong in the face of the Spanish. 5. At this early stage, why might the Powhatan have wanted the priests to remain with them? If they see the priests as a means to receive food and relief they want them to stay close. Also the priests are easier to control or eliminate if they remain with the Powhatan. 6. Why would it have been important to tell Governor Hinistrosa about the Indians’ desire to “be like” de Velasco and about their desire to have the missionaries remain with them? This would have encouraged the Governor to send supplies to the colony in order to further the ability of the priests to Christianize the natives. They seemed to think that don Luis had risen from the dead and come down from heaven, and since all who remained are his relatives, they are greatly consoled in him. They have recovered their courage and hope that God may seek to favor them, saying that they want to be like don Luis, begging us to remain in this land with them. Thus we have felt the good will which this tribe is showing. On the other hand, as I have said, they are so famished, that all believe they will perish of hunger and cold this winter. 7. In the entire text the Jesuits mention the Powhatan’s “good will” three times. Why might they have done so? How do the Spanish interpret this “good will”? Why might the Powhatan have shown them “good will” at this early stage? The priests may have mentioned the “good will” to emphasize the openness of the Powhatan for Christian conversion, thinking that the Powhatan would be good candidates for conversion. The Powhatan may have shown “good will” in order to receive food but also to determine the priests’ motives and military strength. 8. How well equipped were the Jesuits to establish a mission? 9. What were the Jesuits’ goals in establishing Ajacán? If the Powhatan asked them to remain in their land, as de Velasco said they did, were the Indians embracing the goals of the missionaries? The goals were conversion of the natives to Catholicism and the discovery of “an entrance into the mountains and to China.” The Indians were not embracing these goals. 10. Why did the priests write for provisions? They needed food and also seeds to plant. This would help alleviate the famine and perhaps open the natives to the efforts of the priests to convert them to Catholicism. 11. What did the chief ask from the Jesuits? Why might he have given such specific instructions? Seeing then the good will that this tribe has shown, great hope is had of its conversion [to Catholicism] and of the service of Our Lord and His Majesty and of an entrance into the mountains and to China, etc. Therefore, it has seemed best to Father to risk remaining despite such scanty stores [low food supplies], because on our trip we have consumed two of the four barrels of biscuit and the small amount of flour which was given us for the journey. We had to help the entire ship with some supplies, as we were ill-provisioned for the journey. As it touches the service of Our Lord and His Majesty, it would be best that you see to it that we are supplied with all speed possible. If it cannot be done this winter, it is imperative that some provisions arrive some time during March or at the beginning of April so that we can give seeds to the tribe for planting. At this time the planting is done here, and thus many of the tribes will come here after being scattered over the region in search of food and there will be a good opportunity for the Holy Gospel. The chief has sought this very thing especially. Examine the evidence and historical context supporting theories on the disappearance of an early English colony. 12. What “blundering” may have occurred? Why does it so upset the priests? Apparently someone traded “trinkets” for corn with the Indians and they now expected the exchange every time. It upset the priests because now the Indians would not give the priests food unless they received something in return. 13. How do the Powhatan respond to the “blundering”? 14. After the priests wrote this letter, the ship that brought them to the Chesapeake left, carrying the letter to the governor of Cuba. The next time sailors arrived, they discovered that the Powhatan had killed all of the Jesuits. What do you think happened? Can you come up with multiple theories? Answers will vary. Perhaps the Indians saw the priests as invaders who could no longer provide goods for them and tried to convert them away from their own culture (religion). Perhaps the priests tried to insist that the Indians provide them with food and the Indians reacted. Perhaps the Indians resented the kidnapping of de Velasco. Perhaps de Velasco wanted revenge for his kidnapping. 15. Why did Ajacán fail? What insights does its failure give you into why many (probably most) early attempts at colonizing North America failed? The priests were ill-prepared for the effort, not bringing enough food. They did not understand or appreciate the Native culture. Many attempts probably failed because the Europeans’ ethnocentricity prevented them from understanding and working with the Native cultures. 16. In 1607, the English founded Jamestown near where Ajacán had been. The English did not know its history, but the Powhatan surely remembered it. What might they have thought when the English arrived? How does knowing about the failure of Ajacán affect your understanding of Jamestown? Answers will vary. The Powhatan may have wondered who these settlers were. They were dressed differently from the priests and they did not have a former Powhatan with them. They also had a different objective. When the English first arrived the Powhatan perhaps wanted to know the intentions of the settlers. Knowledge of Ajacán helps to explain why Jamestown had the “starving time” and Indians did not come to their aid immediately. By a bit of blundering (I don’t know who on the ship did it) someone made some sort of a poor trade in food. I see now the misfortune which followed, in that while up till now the Indians whom we met on the way would give to us from their poverty, now they are reluctant when they see they receive no trinkets for their ears of corn. They have brought the ears of corn and other foods and asked that they be given something when they handed them over. They say that they have done that with the others. Since Father had forbidden that they be given something, so that they would not be accustomed to receiving it and then afterwards not want to bargain with us, the Indians took the food away with them. Thus it seemed good to Father [de Segura] that he should tell this to you since we must live in this land mainly with what the Indians give us. Take care that whoever comes here in no wise [way] barters with the Indians, if need be under threat of severe punishments, and if they should bring something to barter, orders will be given that don Louis [de Velasco] force them to give in return something equal to whatever was bartered, and that they may not deal with the Indians except in the way judged fitting here. How would you characterize Dodding’s attitude toward the Inuit? What assumptions does he make about the Inuit in general and the man in particular? How might a colony full of Europeans who shared Dodding’s attitudes and beliefs have related to the natives surrounding their settlement? Excellent quality and mix of primary and secondary sources, both visual and textual. This lesson strongly supports college readiness skills and prepares students for high-stakes testing such as the PSAT, SAT, and ACT.